There’s nothing I love more than forecasting nursery design color trends! I’ve been in the nursery design business for almost ten years now, and each year new colors and color combinations explode out of nowhere and leave me wondering why we never thought to use them in the nursery before! It should be your favorite room in the house—it’s the only room where rules don’t apply, and kids absolutely love color. Here are some of my favorite nursery design color trends I’ve spotted in the project gallery. Mint is one of the colors that’s been trending the most recently. I love the contrast of the bright pink accents with the soft mint walls and crib bedding in this botanical nursery. But the color mint isn’t just for girls—this sweet green hue works well for boys too, and you can add a funky twist with black and white accents! Navy blue and bright green are back! This color combination was a big trend for boys years ago before light blue and white took over. I’m glad to see this bold color combo has returned to the scene because it doesn’t get any more boy than this! Check out this whimsical nursery that features navy blue walls and bright green accents with a touch of orange to bring it all together. Coral and gold are hot hot hot! 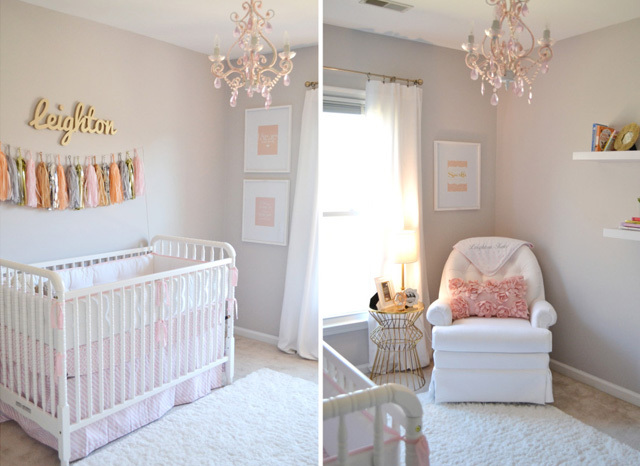 I love all the simple touches of Hollywood glam in this feminine nursery. This room features gold name art and tissue tassels above the crib, perfectly framed wall art, a vintage gold and coral chandelier and a funky gold nightstand (from Target—wow!) that are all seamlessly styled together. The sweet shades of coral and gold accents against the clean white walls give the room a sophisticated feel and glamorous style. Taupe is the new neutral, and although I’m usually a color-loving kinda girl, this sweet, rustic nursery has found a special place in my heart. This is the perfect example of not going overboard with any one trend. The chevron curtains, pallet wall and adorable wooden flag letters all come together as nursery design perfection! Which of these nursery design color trends are you loving this year? We love the taupe very peaceful.